In my last post, I shared where my work time went over the Spring 2018 semester. I was curious about when I was doing most of my work, so I broke down the numbers even more. I was interested in knowing how much I spent working before 8 AM, between 8 AM - 5 PM ("normal" working hours), between 5-8 PM (work that would have been going on during the critical kid hours of dinner, bath time, and bedtime), and after 8 PM. 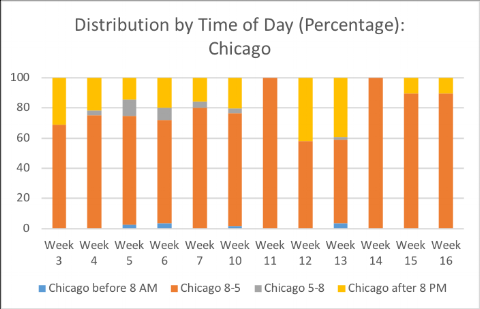 In these figures, the percentage is in terms of percentage of Wheaton or Chicago hours for that given week. Here's my "Wheaton" hours (time spent on teaching and service activities). And here are the numbers for Chicago. The next thing I'm thinking about is, am I happy with this? But I don't think I can really answer that question. All I can say is that it is okay. There is a sizable amount of time working after 8 PM. But it's fine. One feature of my work as a professor is some flexibility to take care of things that come up, outside of teaching time. (I should note that there are some differences of opinion on this -- some people think that professors should be in their offices 8-5 with their doors open -- and I think this difference can really hurt those who can handle the flexibility just fine while getting duties done, if there is someone above them who doesn't agree with it. That's another post.) So a lot of the evening work was from pushing some tasks down the line for the later hours of the day so that I could get a kid to a doctor's visit or something like that. The evening work also came from big pushes to get a load of abstracts and proceedings out. It's all fine. It's just what needed to be done. I don't mind working in the evening after the kids go to bed, a so-called "second shift" as defined by Laura Vanderkam. Some time management resources talk a lot about women getting up really early to work, but that is just not possible for me right now: our house is old and creaky and I would surely wake everyone up if I got up early, and we have one particularly early bird kiddo and I don't dare wake him up any earlier than he already gets up. So I currently quietly answer emails on my phone right after waking up until the kids are up, but I don't try to wake up super early. However, I am pretty sure that in the future I'm going to have to rethink this relying on a second shift, as my older child is staying up a bit later and is very interested in asking me a lot of questions about what I'm working on. If you have tips for that transition, I am very interested in them. 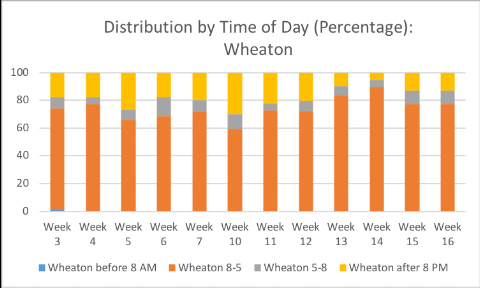 What I am surprised about is the percentage of Wheaton time happening during 5-8 PM. I'm not sure what this is coming from - but it was very consistent. I've been very clear with my department that I can't really take on meetings or activities with students after 5 PM. Since I'm starting up time tracking again this month, I will make some special notes when I'm working on Wheaton stuff during 5-8 PM. I need to clearly identify what is going on with this.